It is rarely the case that enterprise data science applications can operate on data which is entirely contained within a single database system. Take for instance a company which wants to build a Customer 360 application that uses data sources across its enterprise to develop marketing campaigns or recommendation engines that more accurately target the concerns of key customer groups. To develop this kind of application you would be faced with a set of heterogeneous datasets such as CRM data, customer support data, and payment records that would need to be migrated and transformed into a common format simply to perform analysis. This can be challenging when your datasets are large or their schemas change, or they’re stored as schemaless CSV or JSON files. The solution to this challenge is to use a database technology such as Apache Drill that can quickly process SQL queries across disparate datasets without moving or transforming those datasets. In this article I’m going to illustrate how Apache Drill can be used to query heterogeneous datasets easily and quickly. Drill enables you to JOIN data in different formats from multiple datastores. 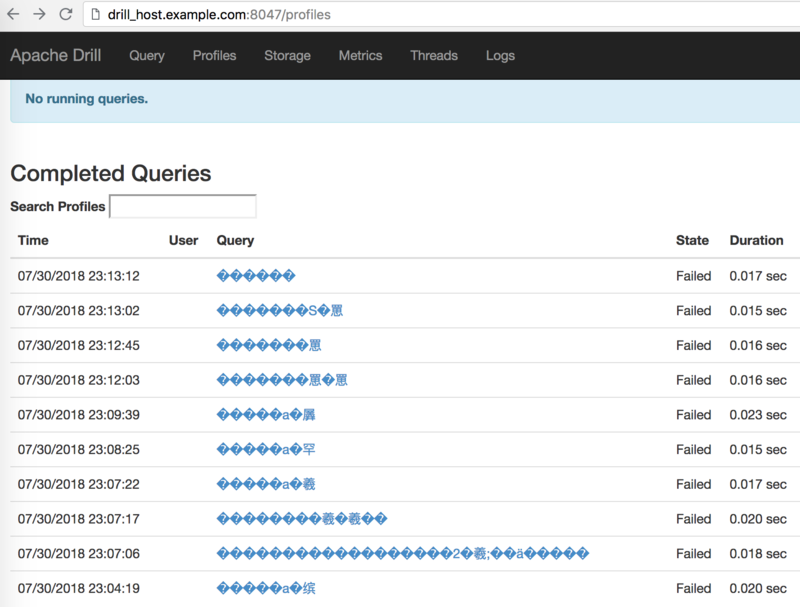 Add a new storage configuration to Drill through the web ui. I’m using a 3 node MapR cluster for my development environment, so I already have Drill installed on each node. 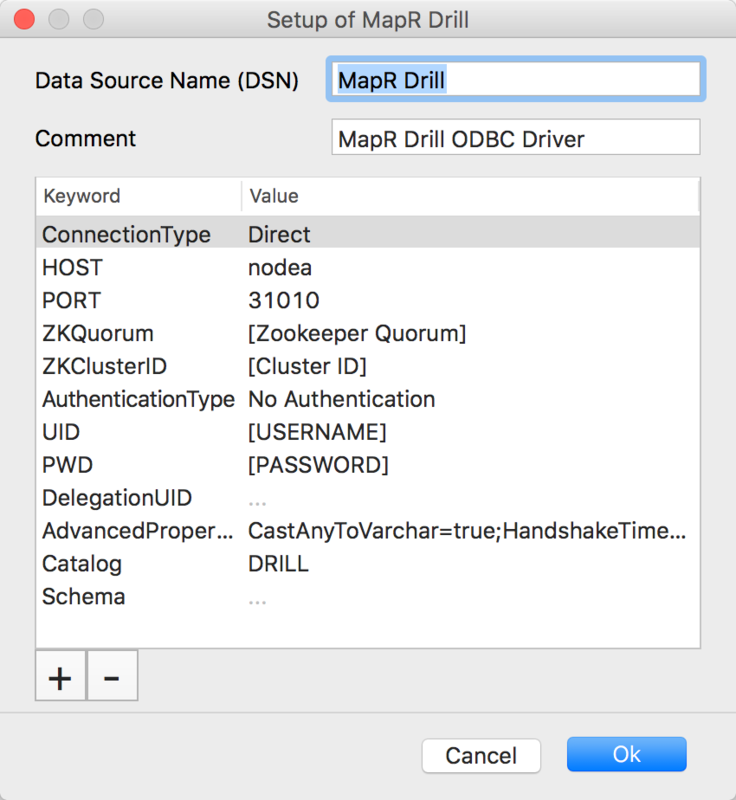 Drill is included in the standard MapR distribution, although MapR does not officially support the RDBMS plugin. The MySQL JDBC connector can be downloaded from https://dev.mysql.com/get/Downloads/Connector-J/mysql-connector-java-5.1.41.tar.gz. So I copied that to /opt/mapr/drill/drill-1.9.0/jars/3rdparty/ on each of my nodes. If you see the error “Please retry: error (unable to create/ update storage)” when you try to save the Storage Plugin then you’ve probably specified an invalid URL for the MySQL service or the credentials are invalid, or something else is preventing the Drill Unix service from connecting to your MySQL service. 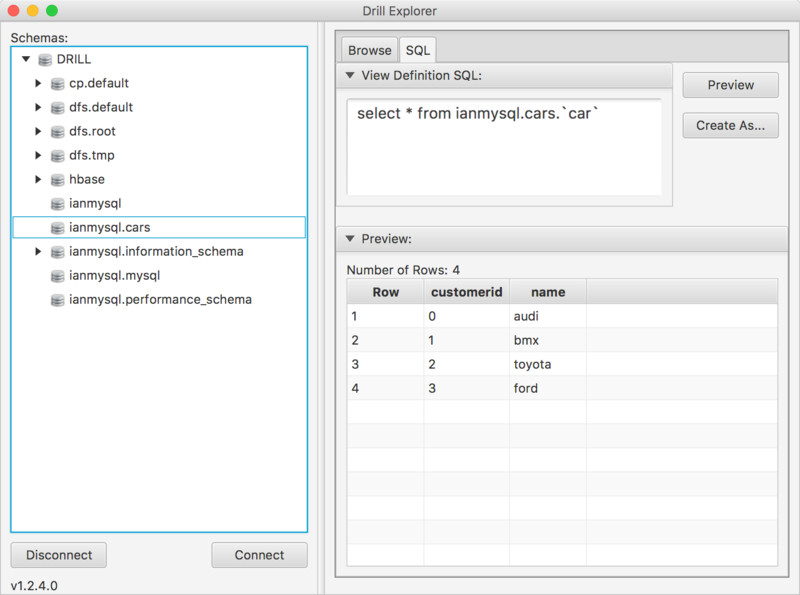 Drill Explorer is desktop GUI for Linux, Mac OS, and Windows that’s useful for browsing data sources and previewing the results of SQL queries. People commonly use it to familiarize themselves with data sources and prototype SQL queries, then use another tool for actually analyzing that data in production. This notebook shows how to join relational and nonrelational datasets with Apache Drill. 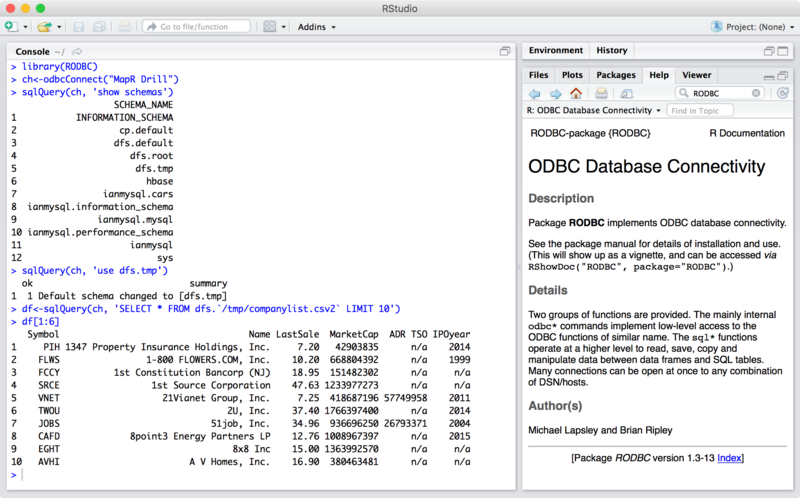 # The DSN was defined with the iODBC Administrator app for Mac. # Setup a SQL query to select data from a csv file. # column names from the first row. s = "SELECT * FROM `dfs.tmp`.`./companylist.csv2` limit 3"
Dealing with unicode in the python ODBC driver has caused me a lot of frustration. Fortunately, specifying unicode decoding options as shown below seems to help. The ODBC driver seems to return column names and table contents as unicode. 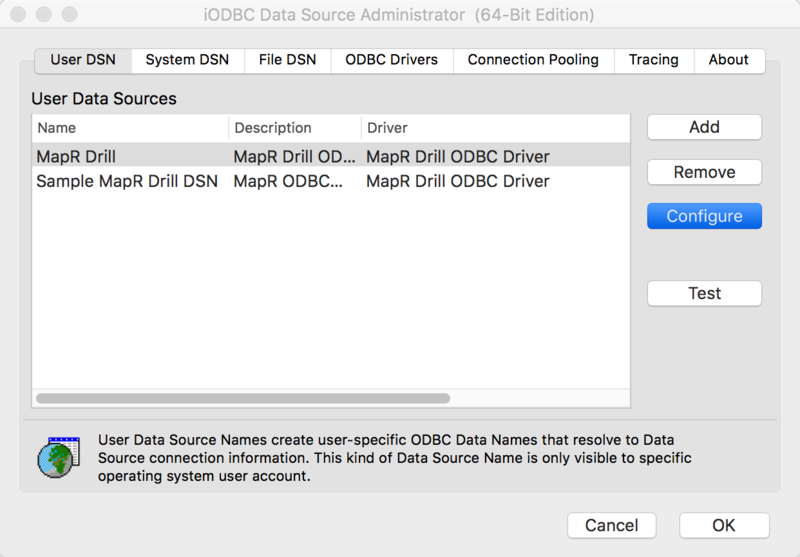 What I’ve tried to show above is that it doesn’t matter how your data is formatted or where its stored, Apache Drill enables you to easily query and combine datasets from a wide variety of databases and file systems. This makes Apache Drill an extremely valuable tool for applications such as Customer 360 applications that require access to disparate datasets and the ability to combine those datasets with low latency SQL JOINs. 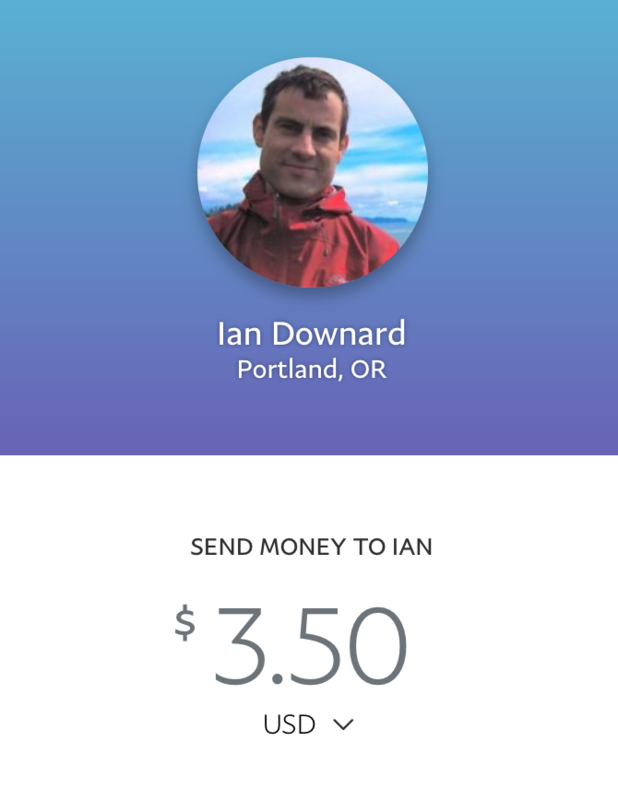 Please provide your feedback to this article by adding a comment to https://github.com/iandow/iandow.github.io/issues/2.